Pears are a favorite fruit at our home. 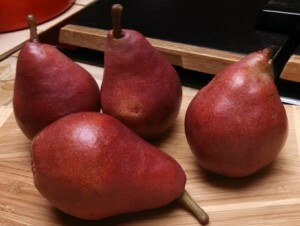 We like the Red Anjou Pear used in salads or fresh slices, though rarely cook with them. 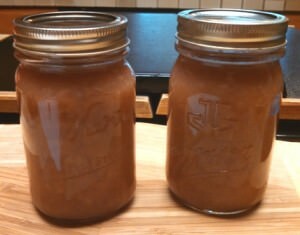 Cinnamon spiced apple sauce is a favorite too, so decided why not make Spicy Red Anjou Pear Sauce. I have several old cookbooks, 1940s, and 50s, they did not have recipes for pear sauce. There was pear jam, preserves, jelly or pears mixed with other fruits for chutneys. So, I made the pear sauce as I do spicy apple sauce. The Anjou pears are sweet and juicy as well nutritious. One fresh medium size pear has 100 calories. They are fat-free, cholesterol-free and sodium-free and provides soluble fiber. Pears are an excellent source of vitamin C and potassium. These pears were from the local grocery, I don’t know where they are grown locally. Wash them good to get any pesticides off the peel even before peeling them. 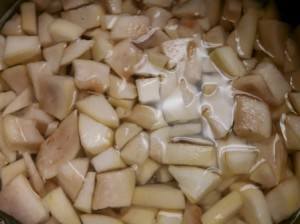 After peeling each, I put them in a pan of water with a tablespoon of lemon juice to prevent the pears browning. I find it easiest to use the vegetable peeler. When all peeled, cut into 1/2-inch pieces before cooking. While placing them in the sauce pan, water and seasons, a picture was forgotten. I added enough water to cover and added another tablespoon of lemon juice to the water, again to prevent the browning, also adds a little extra flavor. Recently made another 2 pints of the Spicy Red Anjou Pear Sauce and added about 2 tablespoons of orange juice when cooking. After the pears were boiling for about 5 minutes, I added the ground cinnamon, nutmeg and allspice. They were on the hard side, needed to ripen a little more, so I simmered them about 30 minutes or more until tender and softened. Cooking will vary to the ripeness and your preference. When they were cooked tender, I added a teaspoon of vanilla. They were cooked more than in the above photo. 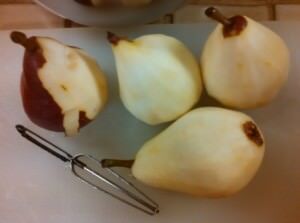 While still hot, put 1/2 to 1 cup pears in the blender to puree. I pureed them more than I had preferred for this first time. Having some lumps of pear in the sauce is more to my liking. Again that is your preference. 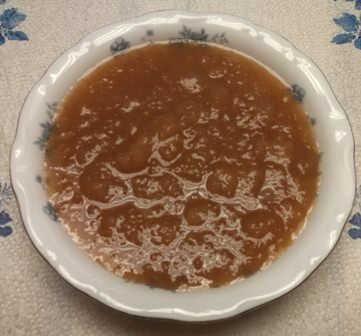 A cinnamon, nutmeg, allspice flavored sauce made from Red Anjou Pears. A tasty side dish to have with pork, chicken or vegetarian as salad or dessert. Serve with cottage cheese. Core and cut into ½ inch pieces into a pan of water with 1 tablespoon lemon juice. Drain the pears and put into 4 quart sauce pan. Add water to cover pears, add 1 tablespoon of lemon juice. Add the sugars and salt. Cook to boiling for 5 minutes. Add the cinnamon, allspice and nutmeg. Cook for 30 minutes, longer if preferred for a softer pear. Remove from heat; add the vanilla. 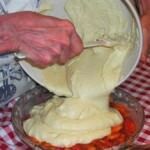 Puree in small batches ½ cup to 1 cup of to the thickness preferred. Pour into bowl to store or pour into clean sterile pint jars. Orange juice can be used in place of the lemon juice when cooking the pears...... Julia Ann and cookbookinabox® in partnership with Netta Belle’s Choice® brings you great recipes for your cooking experience. ©2007-2018 Netta Belle’s Choice® The Art of Gourmet Cookery® cookbookinabox® “Reg. U.S. Pat. & Trdmk. Off.” Reg. “Trade-marks Canadian Intellectual Property Office. “Netta Belle’s Choice® The Art of Gourmet Cookery® cookbookinabox® All rights reserved. The 4 pears actually made about 2 1/2 pints or 5 cups of sauce. The sauce had to be sampled to see if it was sweet, spicy, good and edible. It was! The jars were refrigerated until used. The sauce did not last long, it was more pears and another batch of Spicy Red Anjou Pear Sauce. Julia Ann and cookbookinabox® in partnership with Netta Belle’s Choice® brings you great recipes for your cooking experience. ©2007-2018 Netta Belle’s Choice®The Art of Gourmet Cookery® cookbookinabox® “Reg. U.S. Pat. & Trdmk. Off.”Reg. “Trade-marks Canadian Intellectual Property Office. “Netta Belle’s Choice®The Art of Gourmet Cookery® cookbookinabox® All rights reserved. This entry was posted in Desserts, How-To, Salads and tagged allspice, Anjou pears, cinnamon, nutmeg, pears, red pears, sauce on February 23, 2017 by Julia Ann. 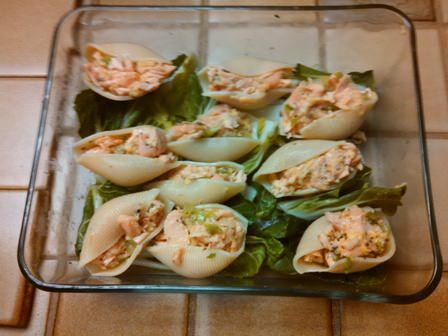 Salmon Shells in Lemon Sauce with Cheese on top. 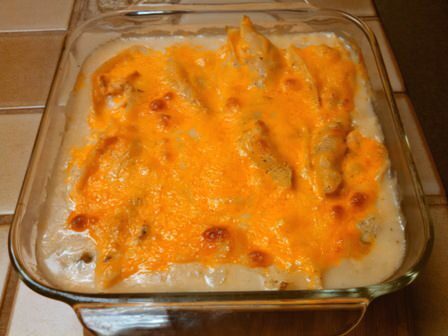 The large pasta shells were stuffed with canned salmon, a blend of vegetables topped with creamy lemon sauce and shredded mild cheddar cheese before putting into the oven. The lemon sauce adds a slight tart flavor to the stuffed salmon shells. 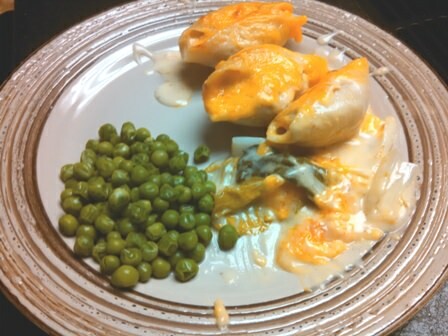 Large pasta shells are stuffed with salmon patty mixture and topped with a creamy lemon sauce with shredded mild cheddar cheese on top. Preheat oven 350 F. Grease a 9 x 13 oven proof casserole dish. Cook 10 large pasta shells as instructions on the package. Rinse in water and set aside. Add the drained, rinsed salmon into a large bowl. Add the stuffing ingredients and blend well. Fill each shell with the salmon mixture. Set shells into the greased casserole. Melt butter in a saucepan that will hold 2 cups. Blend in the flour with a whisk until thickened. Gradually whisk in the chicken broth and cream or evaporated milk. Using a whisk, stir constantly while cooking to a smooth and medium thick sauce. Add the lemon juice and nutmeg, blend. Pour the sauce over the stuffed salmon shells. Sprinkle the shredded cheddar cheese on top. Bake 350 F for 20 minutes, until browned and bubbly. The sauce is adapted from Claiborne, Craig, The New York Times Menu Cook Book, 1966. p.134........Julia Ann and cookbookinabox® in partnership with Netta Belle’s Choice® bring you great recipes, outstanding herbs and spices for your cooking experience. ©2007-2018 Netta Belle’s Choice® cookbookinabox® “Reg. U.S. Pat. & Trdmk.Off.” Reg. “Trade-marks Canadian Intellectual Property Office.”nettabelleschoice.com and cookbookinabox.com. All rights reserved. I am sure we all have a menu to resort to at the end of pay period. Mine was making tuna casserole, using noodles, peas and a can of tuna, maybe with a can of mushroom soup. After about 3 months of that recipe, my husband informed me he did not like tuna. So I switched to salmon patties for awhile. Well, 50 year later, tried salmon patties again. After a couple of meals, decided best to look for another recipe to use canned salmon. 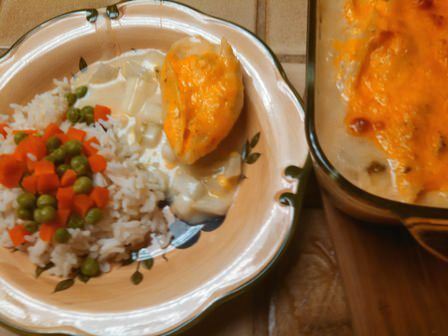 It was the development of Stuffed Salmon Shells in Lemon Sauce with cheese. 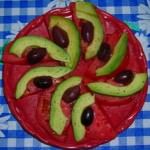 Tomato, avocado and black olive salad. 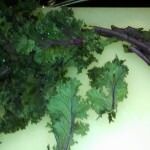 Fresh kale for steamed kale. Julia Ann and cookbookinabox® in partnership with Netta Belle’s Choice® bring you great recipeso for your cooking experience. ©2007-2018 Netta Belle’s Choice® cookbookinabox®“Reg. U.S. Pat. & Trdmk.Off.”Reg. “Trade-marks Canadian Intellectual Property Office.” nettabelleschoice.com and cookbookinabox.com. All rights reserved. 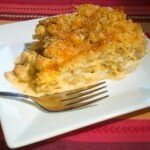 This entry was posted in Menus, Pasta and Rice, Seafood and tagged cheese, lemon, nutmeg, pasta shells, salmon, sauce, seafood on February 17, 2017 by Julia Ann. This recipe is very similar to a previous recipe posted as Salmon Shells in Lemon Sauce. The difference is in the stuffing of the pasta shells. Instead of using the canned salmon, I microwave-steamed the salmon filet, 12 ounces with the skin on. I removed the skin and fat from the cooked salmon and use a loosely packed 1 cup measure. Flaky steamed salmon fill large pasta shells, bakes on diced bok choy and covered with a creamy lemon sauce and plenty of shredded cheddar cheese for a delicious meal, add the salad. Cook 10 large pasta shells according to instructions on package. Rinse in cold water and set aside. Steam the salmon with lemon juice and water in the microwave 3 minutes, until just flaky. Drain and remove the skin and fat from the salmon, discard. Measure the flaked salmon, use a loosely packed 1 cup. Put the salmon in large bowl. Add the ginger, garlic, salt, celery, saltines and beaten egg. Blend without shredding the salmon. Stuff into the large pasta shells, set aside. Put 1 cup of diced bok choy on the bottom of the greased casserole. Place the filled pasta shells on top. Set aside while making the lemon sauce. Melt butter in one-quart sauce pan. Blend in the flour with a whisk until a smooth paste. Gradually add the chicken broth, whisk until smooth. Stir in the cream or undiluted evaporated milk. 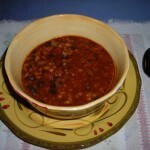 Stir constantly until the sauce is smooth and thicken. Blend in the lemon juice and nutmeg. Pour sauce over the stuffed salmon shells. Bake 350 F for 30 minutes, or until browned and bubbly. 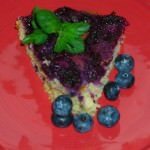 Julia Ann and cookbookinabox® in partnership with Netta Belle’s Choice® bring you great recipes for your cooking experience. ©2007-2018 Netta Belle’s Choice® cookbookinabox® “Reg. U.S. Pat. & Trdmk.Off.” Reg. “Trade-marks Canadian Intellectual Property Office.”nettabelleschoice.com and cookbookinabox.com.All rights reserved. Julia Ann and cookbookinabox® in partnership with Netta Belle’s Choice® , bring you great recipes for your cooking experience. ©2007-2018 Netta Belle’s Choice® cookbookinabox® “Reg. U.S. Pat. & Trdmk. Off.”Reg. “Trade-marks Canadian Intellectual Property.”nettabelle’schoice.com and cookbookinabox.com. All reihts reserved. 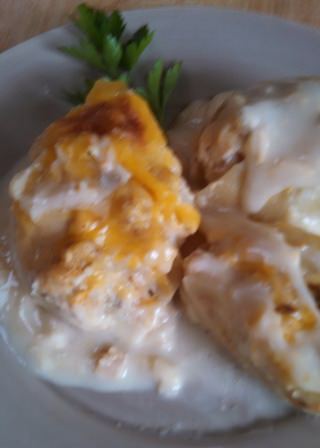 This entry was posted in Pasta and Rice, Sauces, Seafood and tagged cheddar cheese, chicken broth, garlic, ginger, large pasta shells, lemon juice, lemon sauce, nutmeg, salmon on May 12, 2015 by Julia Ann. Canning fresh peaches and baking a cake makes for good eating, not for dieting. 6 pounds of Velvet peaches from the farmer’s market made 6 pints of canned sliced peaches in a light sugar syrup: 1 cup sugar to 3 cups of water. 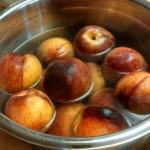 After washing the peaches, boiling water was pour over them for about 40 seconds, lifted out of hot water into an ice water bath to cool and loosen the peel enough to slide off easily. 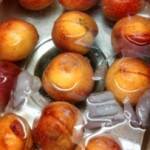 I sprinkled on some lemon juice to prevent browning then cut the peaches in half-inch slices. These peaches were freestone, that is, the peach stone came out easily. Fresh Velvet peaches for canning and cake baking. Peaches in ice water to cool, loosening the skin to easily slide off. Bare peaches ready for slicing to can or bake. Did you know fresh peaches are recommended in weight control? 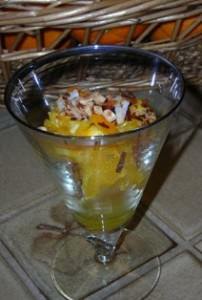 Now how about a recipe for Peach Upside Down Cake with calories! Peaches are arranged on top of brown sugar and butter, the batter is added. The baked batter on the peaches. A buttery moist cake topped with sweet fresh peach slices with a syrup drizzling over it. 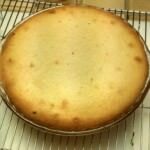 Preheat oven *325 F for 10-inch glass pie plate; 350 F for 10-inch cake pan. **Place foil on bottom shelf to catch any dripping juices. 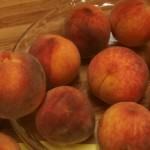 ***Wash and slice peaches into 1 tablespoon lemon juice, gently coat peach slices. Mix brown sugar with melted butter in a small bowl. 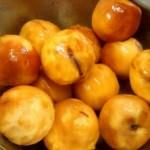 Drain juices off peaches; arrange peaches on sugar-butter mixture. Measure and blend dry ingredients in bowl. In a large mixing bowl, cream butter and sugar until light and fluffy. Add eggs one at time, beating after each addition. Alternately add the dry ingredients and the milk, beat after each addition to blend. Pour batter on top of peaches. Bake 45-55 minutes, test for doneness by inserting tester in center; it comes out clean when done. Serve warm with whip cream or ice cream. *Baking in glass takes longer to heat up, but maintains temperature. If there is much sugar in the recipe, it is best to bake at 25 degrees lower to prevent burning the sugar before it is baked through. **Putting foil in the oven while it is preheating brings the foil up to the oven temperature. The sheet will catch any juices while baking. 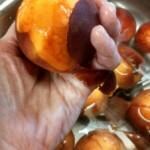 ***Adding lemon juice to the fresh sliced peaches prevents browning. This is drained off before using the peaches. 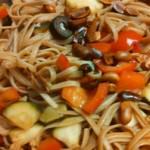 cookbookinabox® in partnership with Netta Belle’s Choice® es, bring you great recipes for your cooking experience. ©2007-2018 Netta Belle’s Choice® cookbookinabox® “Reg. U.S. Pat. & Trdmk.Off.” Reg. “Trade-marks Canadian Intellectual Property Office.” nettabelleschoice.com and cookbookinabox.com. All rights reserved. Inspired by ³Gourmet Magazine, 1993.
cookbookinabox® in partnership with Netta Belle’s Choice® bring you great recipes for your cooking experience. ©2007-2018 Netta Belle’s Choice® cookbookinabox® “Reg. U.S. Pat. & Trdmk.Off.” Reg. “Trade-marks Canadian Intellectual Property Office.” nettabelleschoice.com and cookbookinabox.com. All rights reserved. 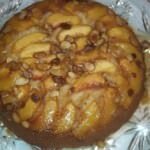 This entry was posted in Desserts, How-To and tagged baking, canner, canning, jars, lids, nutmeg, peaches, rings, upside down cake on August 15, 2013 by Julia Ann.